What is the best Bike Trailer for two children? You can spend from a low of ~$25 (used) to ~$600 new (with all the accessories). It depends on what you want to do. Do you ride alot, where will you store it, what kind of terrain will you be on, do you plan on using the trailer for touring are most of the questions you'll need to answer to point you in the right direction. Used is a great way to go if you know what you want, the trailer is in good shape and want to save money. If you are going to ride alot and "abuse" the trailer, check out the cost to replace fabric. Burley at least used to be very expensive and very difficult to find. I do not know about Chariot (another high end brand). I have a lesser known Cycletote. They are probably the easiest to deal with in terms of getting things, but they are small mom & pop type place. If you have covered storage for the trailer this may not be an issue for you. More expensive trailer brands are Burley, Chariot and Cycletote. The mid-range would be something like a Trek, at least they used to be as I have not priced them recently. If you have alot of hills and expect to carry larger loads, 2 kids or alot of gear, you should look for something that has a brake on the trailer. I am sure that Cycetote has a brake, Burley and Chariot may but I am not sure. Chariot has the most accessories and seems best fitted for true conversions such as jogging stroller, skiing, etc. Also Chariot is the only one with shocks that I know of. I think the shocks are a neat idea, but I honestly have not wished I had them on ours. Transport of the trailer can be an issue. Our conversion (convertible to a touring trailer) Cycletote does NOT easily breakdown but the family version apparently does. I think the Burley and Chariots fold down almost as easily as jogging strollers. If you will do say 2k miles a year plus and expect to run the trailer for 4 years plus, I'd say go for the more expensive trailers. The cost will be minimal over that time, plus you'll have some resale at the end. If you are doing neighborhood rides only with the occasional group ride then the cheaper ones will likely work fine for you. Expect to get very little for them or have to donate them after you are done. The cheaper $100-150 trailers are a dime a dozen. You can find almost any trailer on Craigslist or eBay. Cycletotes are very rare. It was too late for us but I just saw on their website that they have a "recycle" section where owners are posting there used Cycletotes for sale. I would have gone that route if that was available when we bought ours I think 5 years ago, maybe 4. Good luck. Let us know what you decide on. Last edited by masiman; 03-10-08 at 11:28 AM. Ok, you helped me out alot by saying the top 3 names. We are looking to spend about $600. I have narrowed it down to the Chariot Cougar 2, and the Chariot XL. I am not sure I want to even look at Burley, or Cycletote, because I don't want to feel overwhelmed. Several of my online friends swear by the Chariot, and think I can't go wrong with it. I am in Missouri, btw. This is going to be my first time back on a bike in 4 years So, needless to say I am very out of shape. Yeah, so I really need something lightweight. Who knows at this point how much use it will get. FYI - the Treks are supposedly made by Chariot, but mine looks different than the Chariots. The Treks run from $400 - $600. I have the jogging stroller attachment for my trek and feel that this is one of the most useful features of a high end trailer. We use the trailer more as a double stroller than a bike trailer. Be sure to inquire about the jogging stroller attachment. We got an In Step, (Quick N EZ model) on Ebay for $100 delivered to our door. Its rated for 100lbs, is light weight, and folds/collapses for storage/transport in a car truck. I have had zero issues with it and have hauled the kids and our little dog at the same time. Even with all of them moving around it handled fine. the bike can also be laid on its side while hitched to make it easier to load/unload the trailer. There is room behind the kids for a diaper bag, picnic basket, groceries, etc. Older Treks were made by Chariot - I have about a 2003 Trek that's identical to one of the Chariot trailers from the same year. Newer Treks (2005 and up, maybe? I'm not exactly sure about the year) are not made by Chariot, AFAIK, and appear very different from the current Chariot offerings. I bought mine on Craigslist for about $100. It was brand-new condition - it had been given to the seller as a gift, and told me she'd only used it one time. From the condition, I believed her. She was shocked when I folded it up to put it in the trunk of the car - she had no idea that it even folded! Prior to the Trek I had a Burley Solo and an InStep. The InStep didn't hold up very well - stitching was coming loose after just a couple hundred miles. It was made in 2004 or so, and I bought it used, so maybe the newer ones are better. The InStep also had the hardest-to-use hitch of the bunch, although it wasn't so bad that it ever kept me from using the trailer, and it seemed solid enough that I didn't worry that it would come loose. If I were to buy another trailer, I would look at Chariot or Burley. Before I found the Trek on Craigslist, I was thinking pretty hard about the Chariot XL. You certainly can't go wrong with a Chariot! We bought a Burley Solo a few years ago for our daughter, but she's now outgrown it so we had to upgrade. We just got a Wike (www.wicycle.com) that will give us room to grow yet. If we had gone with the Chariot we would still be using it as it has more height and length inside than the Solo, but were scared off by the price . We Love our Chariot Caddie! It's even in my avatar! Welllll, I ordered a Chariot Cougar 2! It should be here either today or tomorrow. I will post back with what I think of it! I might be awhile since I still haven't even got my bike to the shop, and our weather here is still in the "winter" mode. We bought a Burley Solo from Health Check Systems.com no sales tax and free shipping. 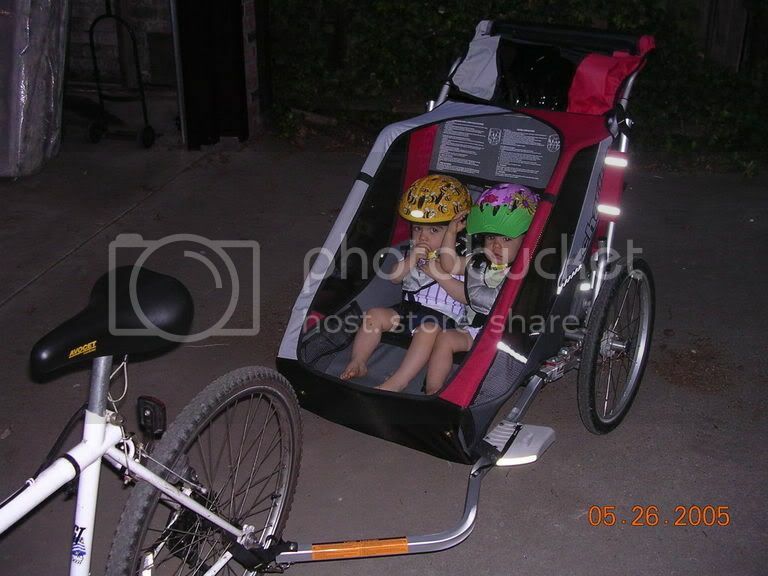 We use it as a stroller for walking/jogging as well as bike trips up to 20 miles. Our son loves his trailer. Obviously a solo only holds 1 child, but the next model up should work well. I can't say enough good about burley. We bought a Chariot Cougar 2 as our third trailer... wish it was our first. The Chariots are really a step above the Burleys. The only bad thing I've found is they are a pain to change from 1 to 2 kids, and vise versa. So if you do that a lot, you may want to check to see if they have fixed that one annoyance (I've complained to them). *Nice Suspension system, kids noticed. *Easy to fold down, just not totally flat. My vote is for the Burley Cub. I got one in excellent condition off Craigslist for $200. The Cub is heavier than average, I think 30lbs, but that's because the bottom is hard plastic rather than basically a nylon sling. There's no way my kids are going to tear it up. This has been very helpful. I think I'll try the used route. I take my dog to work with me & now that I'm biking I need something to haul him in. AND I have a 16 mo old grandaughter that I want to take for rides thru the neigborhood, to the park, etc. Another vote for the Chariot. Here's a photo of our twins in their Chariot after a summertime after-dinner ride around the park. They were about a year and a half then. They're 4 now so it's a bit of a tight squeeze, but we still get a lot of use out of it. And we got the jogging kit as well. During the fall and winter when it was foggy and rainy we'd go out for a run. Always nice and dry and cozy. More often then not, they'd be asleep by the time we got home. They are a bit spendy, but well worth the money. Of course, if you can find a used one, all the better. Good luck! A cheaper alternative is InStep Sierra Double Bicycle Trailer. It easily fits two bigger kids.